Sudak is rich for its long and bright history. Over the centuries it has been known by several names - Soldai, Sugdei, Sugdag, Surozh - but the name Sudak is the most common. The first written record of a fortress on the site dates from 212 AD. In the middle ages, the Genoese engaged in international trade via Sudak, and documents dated from approximately the year 1270 mention the city. The Sudak stone fortress was built by Venetians in the 12th century. 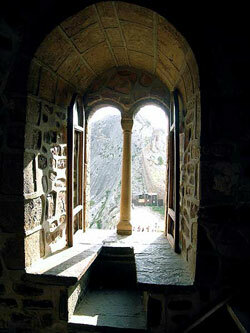 The Venetian consul was based in Sudak which denotes their strong interest in trade in the region. In some 13th century documents, the Black Sea was even called the "Sudakski Sea". The high importance of the town in international trade and in the development of cultural connections with a variety of countries was such that in 1282, the head of the Surozh Eparate (bishopric) ranked as a metropolitan. In the mid-thirteenth century the population reached 10 -15 thousand. There were Russians, Greeks, Armenians, Tatars, Italians and other nationalities present. Then the Genoese and Byzantines conducted a ferocious war for the Black Sea ports and coastal areas, and won; by the end of the 13th century they had control of Kaffa. Despite this, for a long time Sudak was able to secure its independence. The Genoese period lasted until the late 14th - early 15th century. At Sudak, the Genoese constructions with their substantial defenses show well-preserved evidence of the Black Sea Italian occupation, and the fortress's stone gateway is simply monumental. The citadel is aligned east-west, and comprises a vallum with three military towers, four curtains, and a complex which includes the consul's tower and a dungeon. On the excavation site, a church area and an cemetery have already been uncovered, as well as areas for keeping cattle, storage pits, and granaries. Also, several housing rooms with open fire ovens and chimney fireplaces were excavated inside the citadel. Close to the fortress itself, a Turkish bath site was uncovered. The Roman layer has not yet been reached, and though not numerous, some finds from the Roman period indicate the presence of a Roman settlement. During the Genoese period, Sudak was dominated by Kaffa and was a secondary port for the Genoese; the city must have been both important and wealthy to them - otherwise, why would they have expended so much time, money and effort in constructing such an elaborate fortification system? Thereafter, the role of Sudak declined significantly . With the breakup of the Golden Horde under Tamerlane's mighty blows, several lesser Chingside princes set up their own hordes. From Kaffa the Turks promptly besieged Sudak, which fell after a heroic resistance. The Genoese were routed out of the Crimea by the Ottomans in 1475-77, losing Sudak, Kaffa, Chembalo, Chersonese, Kalos Liman and other bases. The Ottoman army then besieged and stormed the Goth-Alan fortress on Mangup Kale, thus clearing the Crimea of its remaining Christian enclaves. Under Tatar control - they acting as agents for the Ottoman Turks - trade, especially in slaves, was centered at Kaffa, while Sudak fell into ruin. 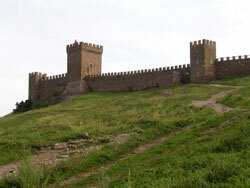 The fortress was in use until the end of the 15th century, when it was destroyed by the Ottomans. The first excavation took place in 1928. In 2005 several levels of the fortress's occupancy were uncovered and a wide range of finds from the mid-twelfth century were recovered. Further investigations will reveal more of the housing constructions and cemetery plans, and the fortress's succession back through time. The Crimean region is extremely rich in other archaeological remains. There are Neolithic tombs; Bronze Age burial mounds; and settlements and house foundations have been found on the Crimean Peninsula in the highland and steppe areas. Also located are numerous Iron Age settlements and small forts built both by the Greeks and autochthonous peoples; Roman sites and forts in the region represented by Kharaks; and many more finds of archaeological interest. Early and late medieval remains survive in the form of numerous churches towers, settlements and some vernacular buildings. A representative selection of these sites will be visited during the season.